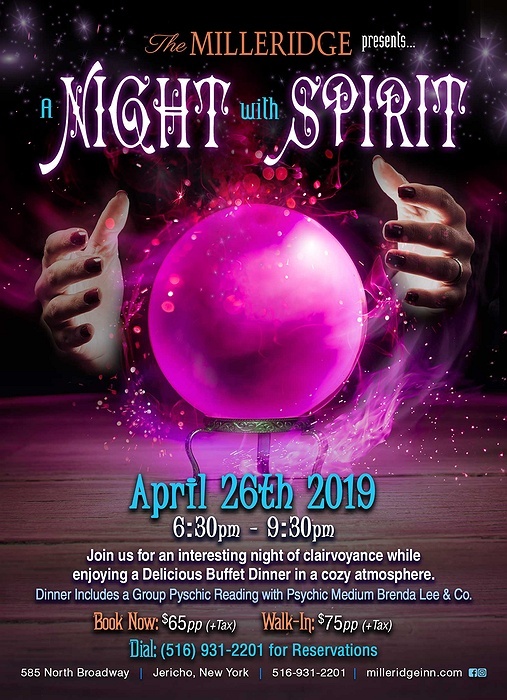 Subject: LongIsland.com - Your Name sent you Event details of "A Night with Spirit "
Join us for a night of food and clairvoyance! On April 26th the Milleridge Inn welcomes Psychic Medium Brenda Lee. Dive into a buffet dinner while getting a group reading in a cozy atmosphere. Seats are limited so please make reservations in advanced. Walk-ins welcome for an additional $10.00. Call to reserve!